If you’ve had a spell of rich food, more alcohol than usual and late nights over the holiday season why not try this easy 2 Day Detox Diet to help restore your energy and vitality? Although Spring is the traditional time to detox many people feel more motivated to do a New Year Detox Diet. Plan to do the detox over a weekend or when you are not working or have any other commitments. Arrange a a long weekend if you can so you can rest and relax. For a week before the detox ease into it by focusing more on whole grains, vegetables, fruit, wild fish, free range or organic chicken, organic eggs, beans, pulses, seeds and nuts. Avoid fatty meat and fried food. Ensure your meals are 75% vegetables + 25% meat, fish or eggs. Try to have a variety of different colored vegetables. Steam or stir-fry them to keep the nutrient content high. Use herbs and spices instead of salt to make them tasty. Reduce your regular tea and caffeine in coffee, colas, and other beverages and drink green tea, clean water and fresh vegetable juices instead. If you normally drink a lot of tea or coffee take even longer to wean yourself off it to prevent withdrawal headaches during the 2 day detox diet. Stop drinking soft drinks with with high fructose corn syrup and and try to avoid alcohol. Look for alternatives to bread and other wheat based products. White bread, white pasta, white rice, cookies, and cakes trigger a rise in insulin levels and causes blood sugar balance problems which often results in sugar cravings and weight gain. Use brown rice, millet, oatmeal, quinoa or amaranth instead. Cut out processed foods, sugar and foods containing it and artificial sweeteners. Reduce dairy products but you can eat live natural unsweetened yogurt. Use rice or almond milk instead. The 2 Day Detox Diet consists of mainly liquid meals for breakfast and dinner with a solid meal at lunchtime. Blend together the juice of 1/2 small medium organic lemon with 8 oz water, 1 tablespoon organic flax oil, small piece of peeled and grated ginger root to taste until well mixed. Sweeten with a few drops Stevia or apple juice if you have to. Wait at least 30 minutes after drinking lemon Flax Detox Drink and then sip a Green Smoothie. Make it from 40 % fruit and 60% green leaves if you can. Place diced fresh fruit in the blender and add a variety of green leaves and enough water to make the blades turn easily. Blend on high speed until very smooth in a high powered blender. Keep drinking herbal tea, green tea, or pure water throughout the day and eat raw veg, fresh berries, a handful of almonds or another green smoothie for snacks. Bean or lentil dish with wholegrain rice and vegetables. Plain roast or poached chicken breast with large vegetable salad or steamed vegetables. You can follow this 2 day detox diet plan for longer if you like. 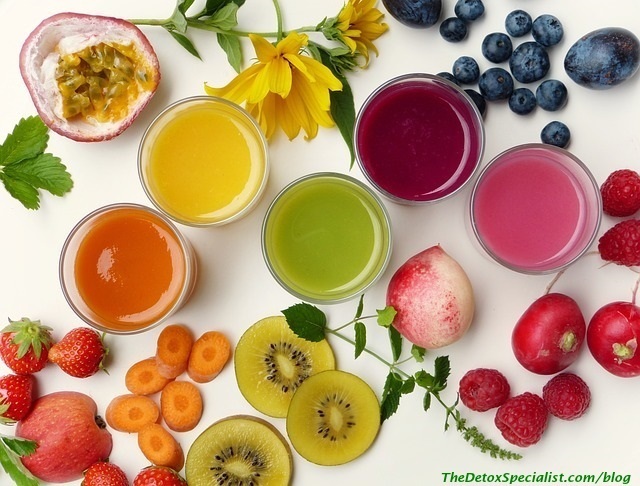 If you’re diabetic, pregnant or breast feeding you should get the advice of a health practitioner who is knowledgeable and experienced in detox before going on a detox diet. Detoxification is not just about diet so here are a few things you can do to help. Give your lymphatic system a treat and do some skin brushing. Your lymph system carries waste away from your cells. Using a firm, natural bristle long handled brush, starting at your feet, brush your body all over using long sweeping strokes towards your heart. Brush your abdomen with gentle circular clockwise movements. Relax and ease tensions in a detox bath. Epsom salts helps to eliminate toxins from just under the skin. Spend half and hour each day doing some exercise. Yoga, stretching, rebounding on a mini trampoline or brisk walking will help to rev up your circulation. Your energy levels may fluctuate during the detox so rest when you are tired. A detox is a good time to kickstart healthy eating so once you have finished your 2 Day Detox Diet ease back into eating solid foods but stay on a healthy diet. Aim for eating at least 7 servings of fresh fruit and vegetables every day and eat a wide variety of colors. Previous Post: « Does Detox Work Or Is It Pointless? This looks like a really gentle detox. Don’t forget to link to your green smoothie recipes article! I’m definitely gearing up for a solid post-holiday beginning-of-the-year detox in the next couple weeks, so this post is particularly well-timed for me. Thanks! Hi there, I missed a trick there didn’t I? Thanks for the reminder. Hope the detox goes well. One of my target this 2012 is to stay healthy and fit. I will heed on the tips shared here. Thanks for sharing and good luck to those who wanted a healthy lifestyle.